Just about to send this dinghy cruise report off to the Wanderer Dinghy Association for their newsletter, but I might as well use it to see if my blog is still alive. We meet just in time to catch the 0740 to Burnham-on-Crouch, conversation difficult after racing across London on our bicycles. Was such an early train really essential? my crew Kass gently enquires, as we glide through the capital’s urban sprawl. Tide and time wait for no man, I patronise smugly. Kass has forgotten more about sailing than I’ll ever know, but manages a smile. We have to make it to Battlesbridge well before the 1320 high tide, as there’s only water for an hour or so either side of high water, and even then it’s but a few feet. We launch W917 from a dew-strewn Creeksea SC at 0930. Creeksea is my kind of sailing club. 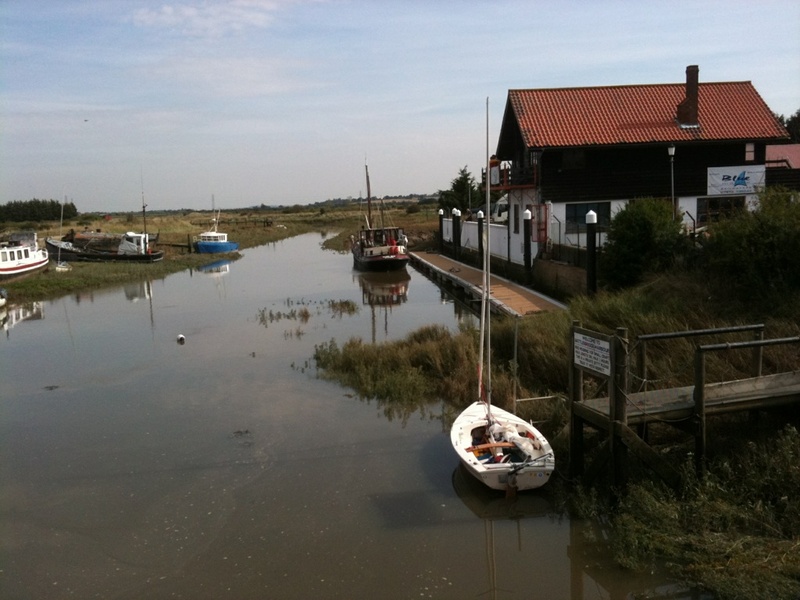 An all-tide slipway a mile upstream from Burnham-on-Crouch, it has no clubhouse and zero pretensions. Tucked behind a wooded headland, it might as well be a million miles upstream from Burnham’s regal posturing. The wind fills in as if to order, blowing away the last vestiges of morning mist. It’s a warm F2 from the south, and we enjoy a fine sunny reach upstream. Helped along by the flooding tide, we zip past North Fambridge (great pub with self-catering) and the delightful Brandy Hole Yacht Station (friendly folk, good food) averaging a very respectable 5 knots. We’re well ahead of schedule, but fall becalmed in the lee of a hillside copse near The Anchor (looks posh) at Hullbridge. The plastic paddle was deployed to avoid bumping into moored yachts, albeit for only a few minutes. The final two miles are a delightful challenge. The river narrows, shallows and wiggles all over the shop. Trees, electricity pylons and the odd caravan park cause the breeze to turn fickle and frisky. Some quickfire short tacking is in order, our half-raised centreboard doubling as a sounding pole – on hitting bottom, we crash tack. As a tactic, it works well in the muddy upper reaches of an East coast river. Please don’t try it in Cornwall. We nearly make it to Battlesbridge, eventually stymied by encroaching reeds and shallows a couple of hundred metres below the low iron girder Bailey bridge marking the limit of the navigable Crouch. We row the last stretch, past an 80 foot barge preparing to leave on the tide (how they turned round I’ll never know) before mooring up alongside the visitors’ landing stage. Truth be told, we are early. It’s only just midday, and there is barely enough water. The real reason I’d wanted to leave London so early was to make sure we’d have time in hand to enjoy the fine view from the café in the top floor of the Old Granary. Now an antiques market, this five-storey structure dominates Battlesbridge, a black, wooden testament to the days when the river was the region’s main trade route to London and beyond. The proprietors and clientele of the café are a sitcom waiting to be written, and provide copious entertainment as we munch our baked potatoes. The sail back to Creeksea is a joy. The sun is at our backs, the wind abeam and we’re sailing together well. Past Brandy Hole the river opens out into marshland and the wind steadies and freshens to a F4. The odd gust sees W917 lifting her skirt onto the plane. We leave leaden yachts chuntering in our wake, grinning with joy as we munch Kass’ homemade treacle flapjack. All is good with the world. We take a detour into lonely saltings to explore Bridgemarsh marina, a lovely sleepy backwater of a marina. Rejoining the Crouch proper, the final mile to Creeksea is a properly bumpy wind-against-tide close-hauled thrash. Kass fulfils the crew’s key function of keeping the helm dry. She doesn’t seem to mind a jot. We haul W917 out just after 1500, and pedal off into Burnham for a riverside drink or two before catching the 1709 back to mad, bad London life. Thank you Kass. Thank you W917 – you may not have a name, but you’re so much more than a number. This entry was posted in Dinghy sailing. Bookmark the permalink.